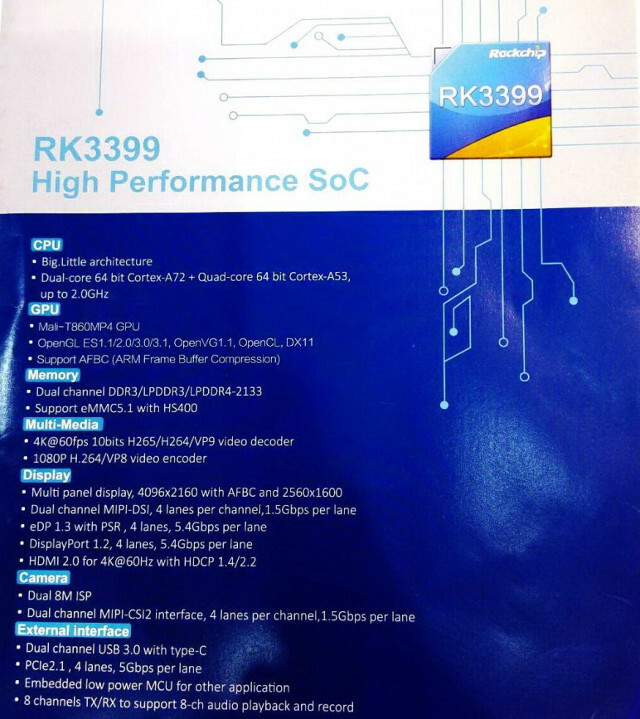 We already knew Rockchip RK3399 was going to be a powerful processor with two Cortex A72 cores clocked at up to 2.0GHz, and four Cortex A53 cores teamed with a Mali-T860MP4 GPU. The processor was also said to support 4K H.265 video decoding up to 60 fps, HDMI 2.0 video output, and Gigabit Ethernet. But the company is now at Mobile World Congress 2016, and has disclosed more details. There’s no SATA interface, but thanks to USB 3.0 and PCIe interface this should not be an issue. Beside Android mini PCs, it’s highly likely Rockchip RK3399 will be found in the next generation of ARM based Chromebooks, once the SoC is launched in Q2 2016. The lack of FOSS GPU drivers is the only thing keeping me on Intel now. Too bad the sunxi community won’t support Rockchip. Rockchip is actually cooperating with mainlining and Allwinner isn’t. Heck Allwinner still won’t drop FEX and use device trees. If that group of developers shifted onto Rockchip, Rockchip would be awesome. Rockchip is doing one intelligent thing that escapes Allwinner. For the most part Rockchip Android releases are unified. ie a single Android drop from them supports about ten chips. Compare this to Allwinner – the king of “port and forget”. Allwinner puts out an Android port for a chip and then drops it like a hot potato. You will never see an update to it. So H3 is stuck on Android 4.4 forever. what about RK RK3229 ..? they has radxa board, they have community? It’s a good chip compare to allwinner. RK3229 is supposed to be compatible with RK3128 except for the video unit. So all of the Fireprime stuff, http://wiki.t-firefly.com/index.php/FirePrime/en should get you started. I have not seen a code drop with support for RK3229 yet, but I haven’t looked very hard for it either. Why would the Sunxi community support the Rockchip SoCs? The individual developers are free to join any Rockchip community and contribute there. I don’t see any point in having the Sunxi website/mailing lists/Github/etc also supporting a completely different set of chips from a different manufacturer. Yes. They’re putting every effort into mainlining their code as much and as early as possible. Even going as far as submitting the drivers before the product reaches the market. This diligence to mainlining was once reserved only to Intel and AMD. Even nowadays, many SoC fabricators only release out of date tarballs on their home page months after the product made it to the market to satisfy the GPL’s requirements and not much else. Sometimes, we only get drivers when the board and device OEMs release it along with their own GPL tarballs and individuals take it upon themselves to separate, clean and submit the drivers. No. They still can’t do anything about ARM refusal to mainline the GPU (Mali) core’s drivers. It’s not their own design or code so they can’t do anything about it. That’s to say, it’s ARM’s fault. Still, the end result is that the device reaches the consumers without full FOSS driver support. If ARM continue on way of more powerful like adding SATA, they will soon meet Intel. I still like device like Raspberry Pi: cheap, take less power, small and software optimized. Would be great to see next gen TV boxes sporting this chip. Should be available 2nd Q of this year. I thought you had more or less given up on hobbyist development boards, as the rewards are limited. Yes! This will probably be the processoe on my next desjtop computer. I’m realu stisfied of rk2389 on my chromebook with linux 100% floss and without 3d acceleration (don’t wany closed src driver on my computer. Even if it’s used there is barely no opengles appkication on linux only found psp emulator firefox or chromium that should use opengles to render webgl also use full gl so no acceleration (chrome on chromeos use opengl es instead). LLVMpipe does a nice job fot lightweigth 3d apps. Even blender is usable with this software rzndering on light scenes. But not 3d games. I mean rk3288 not 2389 :). ARM has released X11 Mali T764 GPU drivers for Linux on their website for Firefly RK3288. So hopefully people will be able to port it to other RK3288 devices and Chromebooks. It should help with 3D games and UI of other Linux OS’s. Do they really mean 10 bit h264? Just like the RK3229? But with more power, and perhaps supporting at least Lollipop? Sounds great… could be my next media player. Hopefully it won’t take too long for them to hit stores. The uCPU used in this SoC is comfirmed to be used as a controller for Type-C and DP control. It was told to start mass production in Q2 and we were hoping to see some devices working with it in Q3. Still there is not even a prototype we saw working. I think there are issues they still could not solve. I have been waiting it to see in an ott tv to buy due to powerfull specs on sheet, but started to worry about delay. It might turn to a dissappointment at the end. Delays are common, and I think we can even say delays are the norm. Sometimes one year or more delays are quite common for SoCs. From the spec it should be possible to use all six CPU cores at the same time ? The only processor I’ve ever seen where all cores could not be used at the same time was Exynos 5410. All other ARM processors that I know of can used all their CPU clusters at the same time within the usual thermal limits which design on the overall system design as much as the processor itself.